and nobody said any different. Nobody bounced until Mean Jean bounced. Until a new kid came to school! 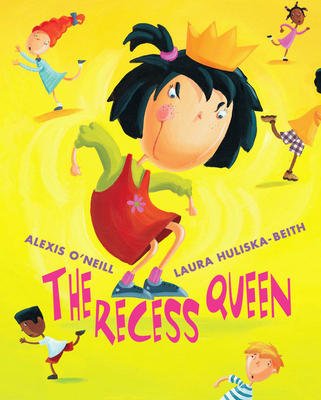 With her irrepressible spirit, the new girl dethrones the reigning recess bully by becoming her friend in this infectious playground romp. ALEXIS O’NEILL's all-time favorite game at recess was kickball. She also loved kick-the-can, hide-and-seek, and red rover, but she wasn't fond of dodge ball (ouch!). Alexis is grateful for the loyal, true-blue friends she has in her life. She lives in Southern California with her best, best friend (who has never ever been her worst best friend)--her husband, David, a computer wiz who makes her laugh. LAURA Huliska-Beith was an enthusiastic “hopper” in the schoolyard, where she was often found playing hopscotch and jumping rope. A not-so-big kid, and now a not-so-big grown up, Laura lives in Kansas City, Missouri, with her four best, best friends (yes, she believes you can have four best, best friends): her husband Jeff, and their three dogs Roxy, Chloe, and Jake. Positing that bullies only act that way because they're lonely, O'Neill (Loud Emily, 1998) puts seemingly meek, new classmate Katie Sue up against aggressive Mean Jean, swaggering boss of the playground. Knowing but one way to deal with challengers ("she'd push 'em and smoosh 'em/ lollapaloosh 'em, / hammer 'em, slammer 'em/ kitz and kajammer 'em . . ."), Mean Jean roughly tries to set Katie Sue straight on the pecking order. But Katie Sue stands up to her with a cheeky, "How DID you get to be so bossy?" and pulls out a jump rope, inviting Mean Jean to jump along. Presto change-o, a friendship is born. Huliska-Beith's (The Book of Bad Ideas, 2000, etc.) rubbery-limbed figures, rolling perspectives, and neon-bright colors reflect the text's informality as well as its frenzied energy. Though the suggested strategy works far more easily her than it would in real life, young readers will be caught up by Katie Sue's engaging, fizzy exuberance. A schoolyard bully is enlightened by the new kid in class in this lively story about the power of kindness and friendship. "Mean jean was Recess Queen/ and nobody said any different," the tale begins. Each day at recess, Mean Jean blasts through the playground--and her cowering classmates--so that she can kick, swing and bounce before anyone else. No one dare cross her path: "She'd push 'cm and smoosh 'em, lollapaloosh 'em." But when tiny Katie Sue, a new student, arrives, all bets are off. Unaware of the playground hierarchy, the new girl enthusiastically kicks, swings and bounces before the Recess Queen gets the chance. Her role usurped, Mean jean moves toward a meltdown, until Katie Sue makes her an offer she finds difficult to refuse: an invitation to play together. O'Neill's (Loud Emily) text brims with fun-to-say phrases that fit a rollicking rhythm, and her assessment of recess dynamics feels authentic. Huliska-Beith's. (The Book of Bad Ideas) memorable Jean busts out of the pages, all sneer, bluster and freckles. Swirling perspectives in the gouache-and-collage artwork provide a sense of movement and largesse. And humorous details, such as steam coming from Mean Jean's ears, or her bouncing another child like a ball, playfully convey the underlying drama of the situation.